Jin-Roh is an animated movie set in an alternate universe in which it is hinted that Japan lost WWII to Germany (weren't they allies?) - people drive Volkswagen beetles, books are published in German and a coated Nazi officer can be glimpsed in the opening narration. The movie features many allegories to the original Red Riding Hood tale before it was cleaned up for modern consumption. If you had seen The Company of Wolves you'll know what I mean. Jin-Roh is also a retelling of Hitchcock's Vertigo. If you will recall, Vertigo is about a man's obsession with a woman who closely resembles someone who he knew, but is dead now. In Jin-Roh the man is a member of a special police unit created to deal with urban unrest and the dead woman is a girl who detonated a bomb she was carrying, killing herself in the process, rather than be arrested. "A sci-fi retelling of Herman Hesse's Steppenwolf, directed by Bergman with a score by Prokofiev . . ."
If graphic novels can be described as pretentious comic books, then I suppose that Jin-Roh can be described as a graphic novel come to life. No-one in Jin-Roh talks like anyone you know, instead they sound like characters from an existentialist play by Sartre, sounding more like philosophy majors hanging around in an arty coffee shop than policemen, terrorists, whatever. Imagine a science fiction retelling of Herman Hesse's Steppenwolf, directed by Ingmar Bergman with a musical score by Prokofiev, then you'll have a better idea of what Jin-Roh is like. If you recognize any of the names I have mentioned here, then you just might have an easier time with the movie's pretensions, but I suspect that is more a question of taste than anything else. To be honest, I also think it depends on the medium in question. Strangely what works here as an animated movie wouldn't have worked as a live action film. Even if you haven't caught any of the names I mentioned, then Jin-Roh has lots to offer the more adult animation fan. (Make no mistake: this is not a movie for kiddies!) While the animation is not as flashy as that in let's say the relatively recent anime effort, Vampire Hunter D: Bloodlust, it is still quite effective and moody. The artwork also manages to avoid anime clichés such as those big western eyes anime characters always seem to have. Seeming deceptively simple, the film's look is its biggest asset. The pace is laborious though and its central character remains underdeveloped. At the end the movie springs some "surprise" twists on the audience. None of these twists have any impact because, to be honest, one had a tough time following some of the plot machinations until then. That the screenplay is by Mamoru Oshii (the same person who directed Ghost in the Shell) makes sense since both movies involve a lot of incomprehensible infighting between various government bureaucracies, tinged with existentialist ennui. Also, it simply serves to muddle some of the film's issues further. 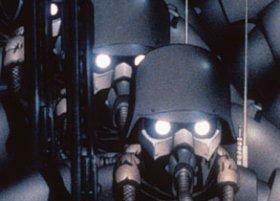 Ultimately Jin-Roh is a decidedly "arty" effort that will delight some and infuriate others. If you prefer brainless actioners such as Jurassic Park 3 and The One, then stay away. If you like graphic novels (as opposed to "comics") and the occasional "foreign" (i.e. non-Hollywood) flick, then check out Jin-Roh. I found myself somewhere between the two, craving some plot clarity while enjoying its more cerebral leanings.